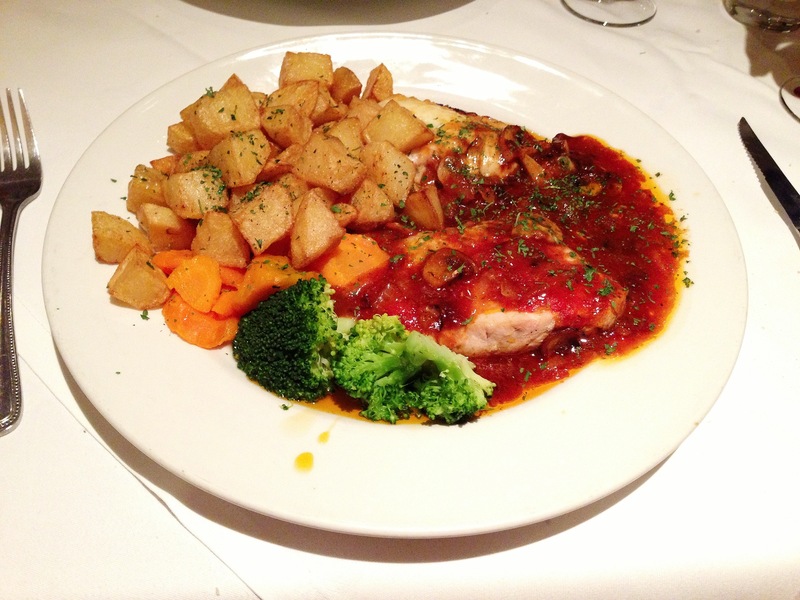 Pepe Sale, 8.3 – Lovely food, superb service and crab ravioli to die for. Read the full review here. ZeroDegrees, 5.4 – Reading needs a place that does great pizza and delicious moules but Zero Degrees, with its cut corners and wonky service, isn’t it. Read why not here. London Street Brasserie, 6.8 – The elder statesman of Reading’s restaurant scene still offers some really good food, but you have to pick carefully and you’re better off staying on the set menu. The full review’s here. 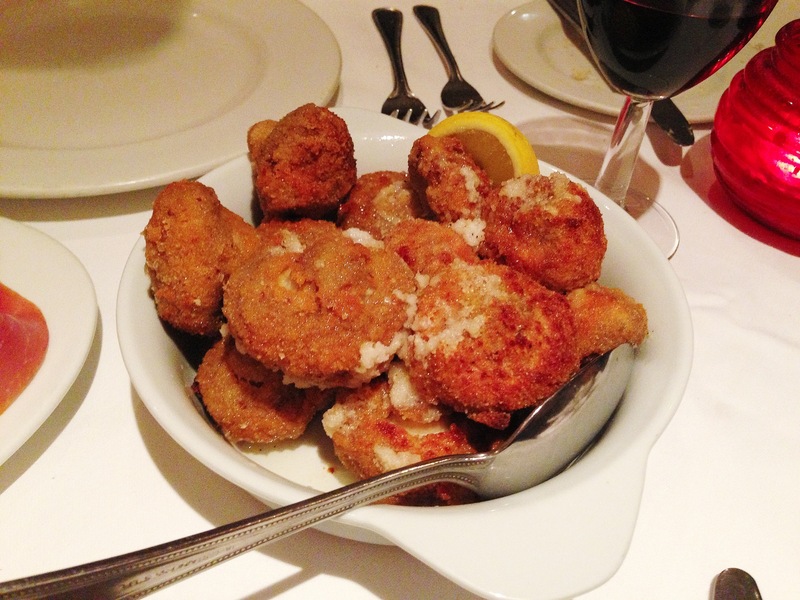 Picasso, 4.1 – When is a tapas restaurant not a tapas restaurant? When the tapas in question is massive, costs almost a tenner and feels like it came from a bad supermarket. The worst rating so far, see why here. Five Guys, 5.5 – It’s just a burger… or is it? The much-hyped latest addition to Reading’s restaurant scene has attracted lots of attention. I chip in (pardon the pun) with my two pence here. In terms of restaurant news, apart from Five Guys, the main place to open since Edible Reading opened its doors is Tasting House, on Chain Street, in a rather unlovely location round the side of John Lewis. It does a small selection of charcuterie and cheese boards, a dozen or so wines by the glass and a large range of wines to take home. I’m not generally a fan of reviewing places just after they’ve opened (although in the case of Five Guys the temptation was too great to resist), but maybe a bit further down the line. It’s only open until eight though, so don’t plan on settling in for the evening if you do go. Also, Thai Nine has closed and reopened as Sushimania, which means it will be part of a small chain with other branches at Golders Green and Edgware. Presumably this is a takeover, like when Sahara closed and reopened as BeAtOne. It’s an interesting move, because every time I’ve been to Thai Nine I thought the Thai food was much more popular than the sushi (and I say that as a sushi lover). I imagine I’ll review Sushi Mania in due course, so watch this space. Another piece of news is that I like to think we’re having an effect on the Reading Post. They published a review earlier this month which wasn’t one hundred per cent glowing – of Wild Lime Bar & Kitchen, which you can read here (apparently it was “pleasant enough”). Best of all, I’m also happy to say that another local restaurant blog has started around the same time as Edible Reading (I know, I know! We’re like buses). Stuff In My Face is a lot of fun, a cracking read and I’m looking forward to seeing what he makes of places round here. His very entertaining review of Pierre’s, here, is a great place to start. Finally, thanks too to everyone who has recommended a restaurant for me to visit. Suggestions so far range from some of the Reading classics like Mya Lacarte and Sweeney & Todd to newish places like The Lobster Room, Bhoj, and House Of Flavours. I’m keeping a list and will try to get to all of them eventually, I promise. Right, better go – I’ve got some meals to plan. I really wasn’t intending to review Five Guys. It’s not that I am some sort of food snob (I’ll eat Nando’s or KFC happily, it doesn’t all have to be sit down meals with a bottle of wine). It’s not even that I don’t like burgers – I do, quite, although I don’t eat them very often. It’s more that Five Guys is a quick meal. A cheap meal. And does anyone really need a review of places like this, where the risk is low? After all, if it’s rubbish you’ve only wasted a tenner, tops, and half an hour. Nevertheless, I went there for lunch and decided that actually, yes, I do want to review it, because it’s a great example of hype versus experience. Before Five Guys had even opened there was a lot of chat on Twitter about how great it was going to be. Only the second one in the UK, and the only one outside London; finally, Reading’s the first to get something! It’s taken a huge site upstairs in the Oracle and all around the walls are quotes about how great they are from all over the US (“The Willy Wonka of Burgercraft”, “The Best $5 Burger A Man Can Eat” – it really is all about men and guys, it seems, which is a great way to irk half your potential customers). Even inside the toilets there are framed magazine covers saying how great their burgers are. Well, they’re certainly a long way from five dollars, but are they all they’re cracked up to be? Arriving at the restaurant there’s initially a bit of confusion because the designers have decided to put a ruddy big table where it makes most sense for people to queue, so they have to have staff ushering people round to the tills. The ordering is pretty simple; this is after all just a burger bar and their tagline is “burgers and fries” so there’s only so involved it can get. So yes, the menu is primarily burgers and little burgers with a choice of fifteen different toppings all included for free (unless you really want a grilled cheese sandwich, or are a vegetarian being forced to endure this by a partner or a pushy friend). We ordered a cheeseburger each but picked different toppings. I had lettuce, mayonnaise, grilled onions, grilled mushrooms, relish, pickles and mustard. I think so, anyway: I must admit that standing in front of my red baseball-hatted server I was a bit overwhelmed by the choices. Between the two of us we also had a regular fries and one drink (which seemed like a good idea at the time, although typing it now it somehow feels a bit cheap). Once you’ve ordered and paid the system works a bit like Starbucks – you take your number, stand at the far end of the counter and watch baffled while you wonder how so many staff can make such a big deal of looking so busy and so noisy and yet your food still takes an age to arrive. Brilliant. In the meantime one of you stands in front of the “Coca Cola Freestyle” machine and tries to pick a drink. All of the Coke brands are there: Fanta, Sprite, Coke, Dr Pepper, Powerade, water, plus some I’d never heard of. The real draw is that you can mix in an extra flavour, such as cherry, lime, raspberry or cherry vanilla. It gives a quite amazing total of over 100 different drinks to choose from like some kind of carbonated jukebox (no root beer though, which disappointed my companion). Like a jukebox, it’s quite good fun to flick through the choices and pick something that you simply can’t get anywhere else. This I liked, although knowing that it’s all syrup and water takes the edge off somewhat. On the upside you can go back as many times as you like and top up your red and white paper cup: bottomless soft drinks, in a place where most of the stuff you order is going to make you far from bottomless. When the food comes it’s in a brown paper bag; there are no trays in Five Guys. The burgers are wrapped in paper-foil and look a bit forlorn – squashed, even though they’ve been assembled by the red ants behind the counter only moments ago. Despite this the taste isn’t bad. The patties (a standard burger has two, which you wouldn’t necessarily know unless you’re really paying attention) are well done but moist – I’d rather have had them pink though, as we shall see, that would probably have made a messy experience messier still. The burger buns are your standard seeded burger baps (despite what any of the blurb might say: their posters say they are baked on site, but that might not apply outside of the US). The fries were OK. We had a regular tub of the Cajun spiced fries and they seemed to go on forever, an endless pile of them looking up menacingly from the bottom of the paper bag. I kept shaking them out into the tub but, War of the Worlds style, they kept coming. At the start the spicing was piquant and exciting; by the end it was just hot and even slightly numbing. I think a good chip, of any size, should be fluffy on the inside and crunchy on the outside but these were firm and if they’d ever had any crispness it had vanished in the matter of minutes it took them to arrive at my table. We sat on some smart oak-finish furniture looking out over the Oracle riverside (say what you like about the food but it’s not a bad view) talking about Five Guys, trying not to get sauce on our clothes and shaking some more fries out of the endless paper bag. Neither of us was sure what the fuss was about. They are just burgers. The fries were OK at best. The drinks machine was ace and a lot of fun. But £20.50 for two burgers, one fries and one drink? Well, it’s a genius marketing concept masking a pretty average lunch. I’m sure this is sacrilege, but I think I might even prefer a Big Mac. One of the editorial decisions I had to make when I started Edible Reading sounds like a minor one, but it prompted much deliberation. Not where to eat, or which font to use, or whether to put captions underneath my terrible pictures, but something more basic: where do you put the mark out of 10? I quite liked the idea, like Pitchfork for example, of putting the mark right at the top so you knew before reading whether I thought the restaurant was any good. In the end, I went with the conventional method of putting it at the bottom. The idea is that people read on to the end, curious about whether I’m going to turn out to be a fan of Pepe Sale, ZeroDegrees, London Street Brasserie etc. Most of the time this works out fine, but the only exception is when you give a bad review. People love bad reviews, and I’m no exception; there’s a certain pleasure to be had from reading one. So I think I should warn you from the outset that this is a bad review. Picasso is not a good restaurant. I won’t go again, and I’d actively encourage you to follow my example. Got that? Right, on we go then. I started out reviewing places I’ve been before – not new places, not unknowns – partly because I wanted to find my feet and partly because I wanted to pick places you might have been, so you could get an idea whether we liked the same stuff and you trusted my judgment. But this couldn’t go on forever, so I asked for suggestions about where I should go next. “Try Picasso”, someone said on Twitter, “I’ve heard mixed reviews and I’ve never been able to bring myself to try it.” Good idea, I thought. What’s the worst that can happen? It turns out the worst that can happen is eating dinner at Picasso. It’s one of those places, ironically, that ought to fill a gap in the market. Reading has never had a decent tapas restaurant, unless you count La Tasca (and, having eaten there before it closed, I don’t). Picasso has been going a long time, tucked away in a quiet little spot just over Caversham Bridge, so it must be doing something right. So I booked a table for 8 o’clock on a Saturday night and wandered across town, stopping in the Moderation for a pre-prandial gin and tonic. Eating somewhere you’ve never been before always has that feeling of excitement and anticipation, like that point at Christmas when you sit on the sofa, ready to unwrap a present in front of all your relatives. The inside of Picasso, I would guess, hasn’t changed in over thirty years; basic furniture in a long thin room, pictures on the walls, cloth napkins, tables not too close together. A few tables were in dark corners, and I carefully avoided being led to one of those. Although it was unprepossessing I was determined not to judge the book by its cover: after all, Pepe Sale does great food and is never going to feature in Elle Decoration. The interior Picasso reminded me most of was the recently departed Nino’s, in Market Place, in fact, another old school restaurant where I’ve somehow never managed to have an inspiring meal. Everything started well: the service in Picasso is very good, authoritative, old-fashioned service. The waiter recommended a Ribero Del Duero which was not on the wine list, was only £22 and was probably the best thing about the whole evening. He also – and this has to be a first – cautioned us against ordering too much food. Two tapas per person was enough for an evening meal, he said, so we should go easy on them. In hindsight, I should have known at this point that something was amiss. Tapas are not meant to be big. That’s the whole point of them, and their whole appeal because it means you can try dozens of little things without being stuck with a giant portion of anything. After all, if you wanted that you’d go to a restaurant that served starters and main courses, wouldn’t you? A look at the menu proved that either the tapas were far too big or they were far too expensive: most of them were between eight and ten pounds. This is definitely the point where alarm bells began to ring, just as other couples started to take their tables. A lot of them had clearly been here before, though, so I must just have been worrying unduly. Mustn’t I? When the tapas turned up it became apparent that they were both too big and too expensive, and worse still just not very good. A plato combinado of jamon serrano and chorizo was limp and insipid. The chorizo was barely an evolutionary step up from luncheon meat with a sun tan, bouncy and tasteless. The jamon serrano was even more of an insult, with the shiny dampness of something that had spent the previous few hours in a plastic catering pack of some description, each slice sandwiched between leaves of plastic. I wasn’t expecting them to have a leg of jamon hanging over the bar (hoping maybe, but certainly not expecting) but I did at least want to feel like this was good quality stuff. I could have walked back into town, gone to Marks & Spencer and got more, better, jamon for under three pounds. I finished it out of sheer stubbornness and almost immediately regretted it. If the jamon was sub-M&S, the mushrooms with garlic butter were sub-Iceland, and even then I am probably being kind. A huge bowl of breadcrumbed mushrooms with a few visible patches of melted garlic butter was plonked in front of us, with a wedge of lemon in case you had pretensions about that kind of thing. Cutting them open they were flabby and damp, and the whole thing had the feel of party food at a party you wished you didn’t have to attend. A funeral, perhaps. We didn’t eat them all. I looked again at the red wine. It was good, but it wasn’t that good. The mains came almost as quickly as the starters had done, and were no better. Cerdo Asturiano was billed as pork fillet cooked in cider and cheese sauce. I was hoping for tenderloin, what I got was two thick slabs of steak with another slab of cheese melted on top of them. The sauce had no evidence that either cider or cheese had been used in it at all, it was the sort of anonymous red sauce that used to be made by Homepride and is now made by Dolmio. For all I know it could well have been. Accompanying it was a gigantic pile of fried cubed potatoes (presumably exactly the same thing you’d get if you ordered patatas bravas), some carrots which either came from a tin or had been cooked to closely resemble those that do, and some broccoli. It was clear that nobody left Picasso hungry, but that it was unlikely they left it satisfied either. Swordfish in a cream, onion and mushroom sauce was just as disappointing. The swordfish was bland and flavourless and the sauce managed, if anything, to be less than the sum of its parts – thin, watery, with a hint of dill that might well have come out of a Schwartz jar. Swordfish, done well, is a beautiful thing but this was just boil in the bag cod in parsley sauce with delusions of grandeur. It came with the same piles of forgettable vegetables as the pork; in fact, I only took a photograph of one of the main courses but they were virtually identical, the single difference being which inadequate protein and sauce combination you’d been unlucky enough to plump for. The only things worth finishing in the whole restaurant, it seemed, were the wine and the experience. It’s worth stressing what bad value Picasso is. Most of the tapas, as I said, were just shy of a tenner. The two mains were eighteen and sixteen pounds respectively. You can eat better for the same money in Reading without having to try very hard, and I’ve already reviewed two places where you can do exactly that. I couldn’t quite believe all the other diners in the restaurant didn’t appreciate this, to the extent where I wanted to stop by their tables on the way out and actively encourage them to go somewhere else next time. As I didn’t do that, I’ll have to console myself by doing it here instead. I’ll say one thing for Picasso, it was mercifully quick. From sitting down to deciding to pass on the dessert menu took an hour and twenty minutes, on a Saturday night, a peak time for restaurants when people want to sit down and have an enjoyable, leisurely meal. The high point of the weekend when we want to sit in lovely cosy room somewhere, escaping from X-Factor and the contents of our fridge and being spoiled and taken care of by other people. There were lots of things about Picasso that were very very wrong, but the worst of all is how it betrayed that promise that every restaurant implicitly makes, that it will whisk you away from all that. It was like eating in a friend’s house, if your friend wasn’t a very good cook, had gone to about four downmarket supermarkets to get all the ingredients and tried to charge you eighty quid for the privilege. If you had a friend like that, you’d stop seeing them. If you knew a restaurant like that, you’d stop going. Believe me, Picasso is that restaurant. London Street Brasserie was almost the first restaurant reviewed for Edible Reading. In many ways it would have been the perfect choice, because it’s hard to imagine Reading without it. As Old Orleans has been replaced by Miller & Carter, as Ma Potter, Yellow River Café, Chili’s and Ha! Ha! have opened and shut and been replaced, it’s always been there, dragging the rest of the restaurant scene in Reading up in quality, year by year. It’s hard to believe that it only opened in 2000 (I had to check, and even then I did a bit of a double take). It’s always done a roaring trade – not just locals, but also shoppers and the occasional celebrity, too. I don’t mean Paul Daniels and The Lovely Debbie McGee, either – apparently Prince Harry was there on Sunday night, mere hours after we’d checked it out at lunchtime, and rumour has it he very much enjoyed the crab (presumably he then dashed off to the casino next door, if past form is anything to go by). Even so, it feels remiss not to review it even if it is one of Reading’s most well known restaurants. After all, does that necessarily mean it’s any good? The set menu at LSB has always been a good deal, so three of us went along for Sunday lunch with the very best of intentions. Three people, two courses, £16 a head: should be a bargain, right? Well. It always starts like that, but the problem is that then you have to have a quick look at the rest of the menu (the “here’s what you could have won” element of visiting a restaurant) and the next thing you know there is some complicated horse trading going on – I’ll have a starter off the set menu if I can have a main from the a la carte and what have you. So we wound up ordering a bit of everything, and convincing ourselves that it was for the good of the review. The winner among the starters, in fact, was from the set menu: halloumi and rosemary with a rocket, peanut and mint salad. This was the one we all wished we’d ordered – the salty halloumi set off perfectly by the mint, not a combination any of us had tried before. The others, though, were less successful. The foie gras ballotine seemed in some places to be more butter than foie gras (some of which had started to melt, possibly because it had been left out too long), and lacked any real complexity. The Sauternes sultanas accompanying it were little unremarkable sugary pellets and the cocoa nibs added more texture than taste. Each section of ballotine was topped with an inadequate triangle of toasted brioche, and the whole thing was a little underwhelming. 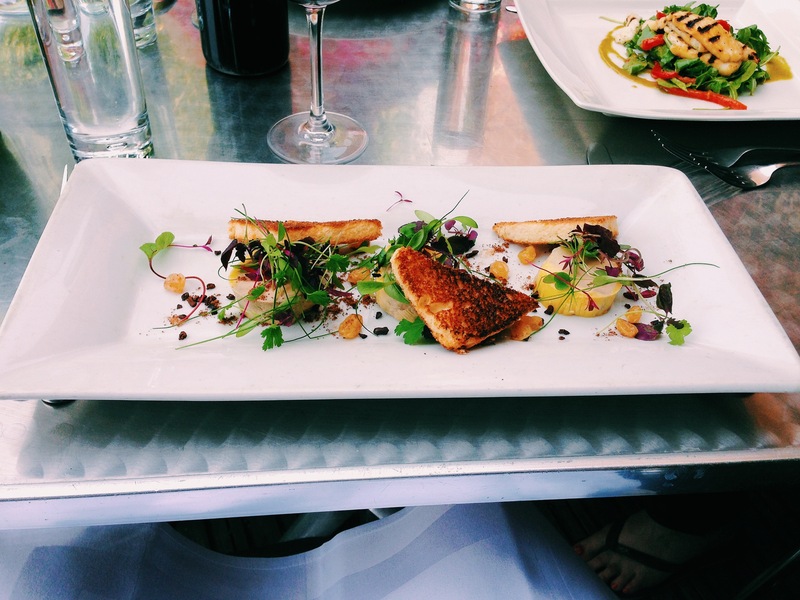 At just under a tenner, it was disappointing stuff – you can argue about whether foie gras is cruel or a delicious necessary evil, but one thing it should never be is empty calories, and this came rather close to that. 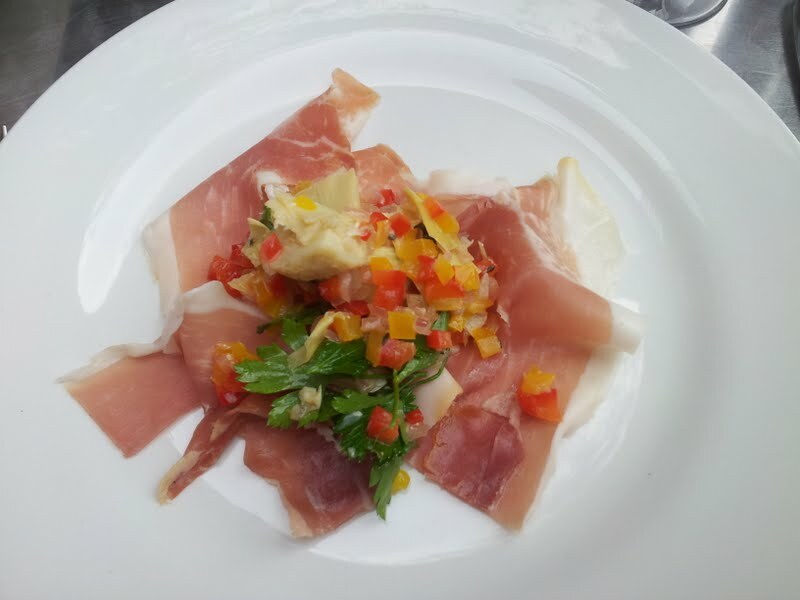 The Parma ham with artichoke and parsley salad, also on the set menu, might have been even less exciting – the ham, despite being air dried, was somehow smooth, wet and fatty and the accompanying artichoke and parsley salad, with finely chopped red and yellow peppers wasn’t anything to write home about. Having used up a large part of my adjective quota on the foie gras, let’s just use one – boring – for this and leave it at that. The mains, happily, were a much better bunch. The fish and chips was a generously sized piece of haddock with a perfect, light crispy batter, along with chips served in one of those little frying baskets that seem to be all the rage at the moment (and which are very popular with me too, as they’re very easy to steal from). The mushy peas must have been good because I didn’t get to try any – you try stealing mushy peas without being spotted some time. The tiny jars of fresh sauces (a red pepper ketchup and tartare sauce) were a nice touch, though the vinegar came in a faddish bottle too, and personally I don’t see what’s wrong with a proper shaker. The Tuscan venison ragu with pappardelle was also very nice, or at least it was when it came out second time around; first time round the ragu was aspiring to warm, although it never quite got there. We did the English thing of apologising for being given lukewarm food and the waiter did the equally English thing of not really apologising but sending it back to the kitchen. 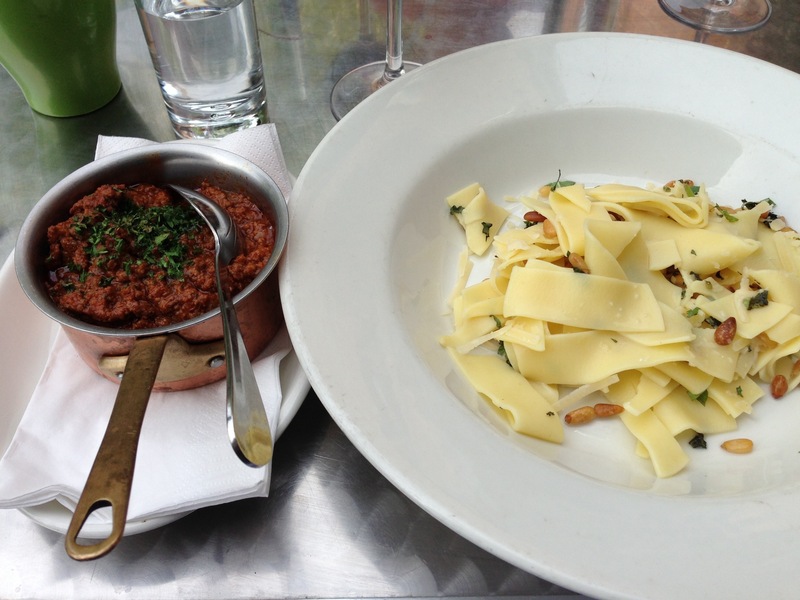 When the replacement arrived – fortunately quite quickly – it was delicious; rich, intense, just the right size, and the pine nuts studded through the pappardelle were also an interesting surprise. I was a bit dubious about the self-assembly element of this – you are brought a bowl of naked pasta and a small saucepan of ragu and left to put it together yourself. Maybe some diners quite like being involved in the process, but I thought plating up really should be the kitchen’s job. My main, garlic and sage marinated monkfish, was lovely. Three mini fillets of monkfish served with sweet potatoes, cabbage and a red wine jus. It sounds simple but it was definitely more than the sum of its parts. It was really delicious – quite light and compact but not stingy which is quite a challenge with an expensive ingredient like monkfish. All this was washed down by two bottles of the Surani Costarossa, a primitivo at a very primitive £27.50 a bottle. The second bottle was a little harder work than the first but we’d already had a aperitif in the bar so things were starting to reach the stage where restraint is a wonderful, if somewhat distant, concept. By this point, the sun had come round to the terrace and a few more barges had gone past so it seemed a shame to leave our table (although naturally, if we’d known Prince Harry would turn up in a few hours maybe we’d have taken things a bit more slowly). So we finished our red in the mellow afternoon sun and looked at the dessert menu, because it never does any harm to look. The desserts on the set menu are a fiver each, a quid or two less than those on the a la carte, so we decided to look at both menus and pick what we fancied. I had the sticky toffee pudding, from the set. So indulgent (although my main was on the lighter side so I felt I could get away with it): a simple square of moist suet pudding, served in a glorious little lake of butterscotch sauce with a quenelle of clotted cream to cut through the sweetness a little. Just divine; done well, nothing fancy, thank you very much. The caramelised lemon tart with stem ginger ice cream appeared on my left, and I’m told it was lovely but I never got to try it. I was told, between mouthfuls, that the caramelised topping in particular was a big hit. 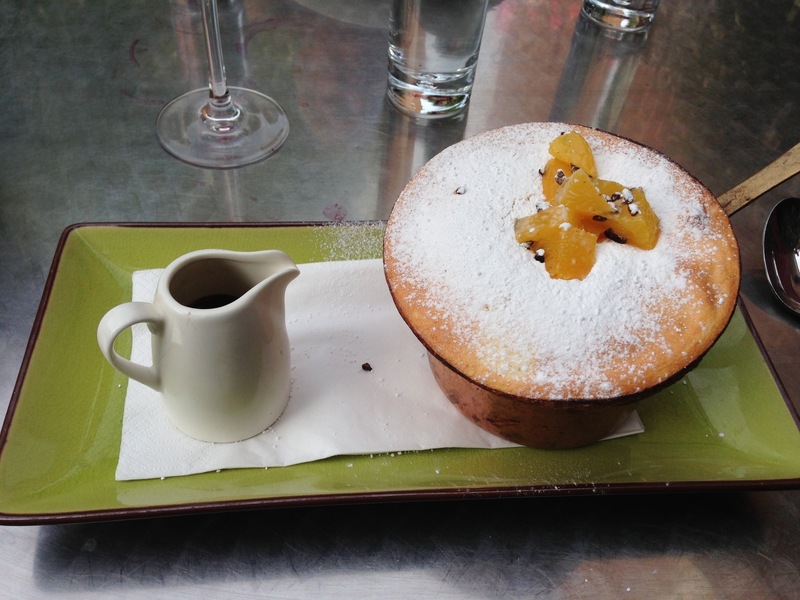 The showpiece dessert, however, was the orange and Grand Marnier soufflé with hot chocolate sauce. A full inch taller than the soufflé dish, this had more fluff on top than Donald Trump in a windstorm. It looked magnificent, but like Donald Trump what lay beneath didn’t quite live up to the impressive topping – undercooked to the point of being damp, it didn’t quite feel right. On the other hand, once the dark chocolate sauce got poured in, the whole thing transformed into a big edible puddle and apparently it stopped mattering so much after that. Of course, that might also have been to do with the bottle of dessert wine we’d ordered. I’m a little ashamed to admit that we washed them down with a bottle of Tokaji (5 puttanyos for those who know their wine) which was incredible, even if it probably contained enough sugar to be a dessert on its own. At £42 a bottle it really isn’t cheap, though in fairness the mark-up on it isn’t unreasonable. The dessert wine didn’t turn up until after the desserts had arrived, and we needed to give the waiter a nudge for it. Service was a bit like that all afternoon – slightly hit and miss but always cheekily apologetic, as if they’d been caught winging it. The whole thing was slightly reminiscent of people at work (and every office has one) who rely heavily on their charm to make sure they’re never quite found out for not delivering things. On a Sunday afternoon, a few bottles of wine to the good, with the sun on the terrace and the barges floating past on the canal, this was all fine, but with hindsight it could have and probably should have been a little sharper. So, it’s been a staple of the Reading restaurant scene since the turn of the century, Prince Harry eats there and it’s always packed, but is it any good? Well, as you can probably tell from the above, the answer – frustratingly – is yes and no. But over the years I keep coming back here. The food is hit and miss, and so is the service – not all of the waiting staff have the finesse that the food deserves – but the riverside setting, the buzz and the sheer range of the dishes (especially on the set menu which I think was a much better deal on the day) mean that it has enough interesting things going on to make me return. Carried away by the summer and the sheer recklessness of exploring the menu our bill for three, for three courses, three aperitifs and three – yes, three – bottles of wine came to £195, but I would say do as I say not as I do, go for lunch or an early evening meal and it’s still a decent place to eat. In 2000 LSB was head and shoulders ahead of almost everywhere else you could eat in Reading. In 2013, it should maybe be a bit less confident about retaining that status.